Suffice to say it’s not a lot of people’s favourite colour. Here in the UK, we do see a lot of it, from the constant clouds in the sky to the churning winter sea to your friend’s face when they wake up after a heavy night out. It’s a continual shade. While many people associate it with depressing, cold times, they often forget how chic grey can look in design. From art pieces to clothes, to homeware, different shades of grey have been a staple of high-end designs for decades now with grey kitchen designs not looking like they’re going away any time soon. From the walls to the floor, to the appliances and accessories, grey can fit in many areas in your kitchen so are you ready to try? Still not sure if grey can fit in your modern kitchen design? Keep reading to find out all about it. 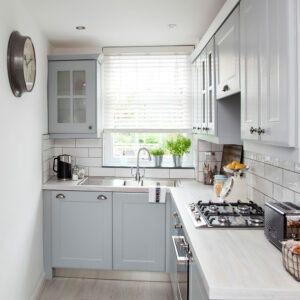 Grey can work in many aspects of modern kitchen design, but that doesn’t mean you have to make sure every single part of your kitchen is the same colour. Grey works wonderfully as an accent colour since it’s monochrome, so you don’t have to worry about it clashing with the other shades in your design. 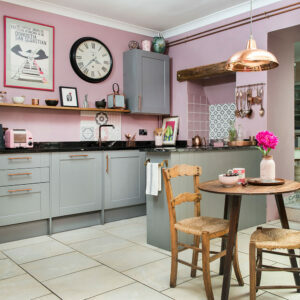 Why not pair medium-grey cabinets and draws with light pink walls for a fun, sweet spring design? Or, if you want something softer, dark grey accents also pair very nicely with pastel blues and whites. If you’re looking for a natural vibrancy, then matching grey with some green tiles around the edges of your room can bring a real freshness to your space and also go well with any plants or herbs you might want to incorporate into your design. One of the most helpful things about light grey is that it can be a great alternative to black or white. While white is great at offsetting darker colours and can open up smaller kitchens, it can be a nightmare to keep clean and can sometimes leave a room feeling sterile. Not so with light grey. Darker greys can work well instead of black if you aren’t ready to commit to a completely dark design or want to be a bit more unique. Grey kitchen designs can incorporate a number of different materials, but this colour works exceptionally well with wood. – Oak: Works well for cabinetry due to it being a hardwood that’s durable and water resistant. – Black Walnut: Another hardwood that’s a much deeper colour. With shades from light brown to rich coffee, this wood is known for having one of the warmest undertones. – Pine: A softwood. While not as strong as those previously listed, softwoods are usually smoother with few grain indentations. To avoid looking like you live in a treehouse, use wood sparingly. While it can look great for your worktop, floor, cabinets and accessories, carefully pick and choose which features you want to be in this material, as well as which will be grey to offset it. Wood mixed in a grey kitchen is also perfect if you’re a fan of more rustic style kitchens. Pair these two elements with some hanging pots over your stove and some open shelving units for a true farmhouse feel. 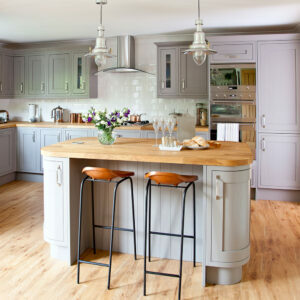 Like any coloured kitchen, grey works best when several different shades are used. Not only will layering your grey elements make certain features pop, but it helps create a sense of cohesion in your space. 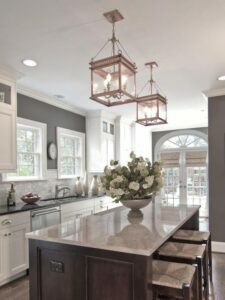 For example, having darker greys for your kitchen island and walls and pairing it with softer grey cabinetry and walls with flecks of lighter and darker shades throughout your accessories. As with all designs, make sure to plan out your colours first and see what will work best for your design. If you aren’t sure, ask an expert like interior designers or look at other similar designs to see what you might be interested in. As we’ve said countless times on this blog, having a small kitchen doesn’t mean you have to sacrifice style. Grey can really open up your space if you’re smart with your design choices. As we said before, light grey can help open up smaller rooms by banishing shadows when lit well. Match the walls with stainless-steel accessories and accents like the sink and oven which will help reflect light around the whole room. Just make sure to stick to lighter shades in smaller spaces as dark colours sometimes have the unfortunate side effect of making shadows seem deeper and making corners feel more cramped. Good lighting in smaller grey designs is key, so why not try some fun pendant lights to brighten up the room, as well as some LED strips under your cabinets to banish any shade as well as giving extra light in places where you could be handling more dangerous utensils like knives. Are you interested in creating your own grey kitchen? Or just want to try some new kitchen ideas in general? Roman Kitchens is here to help. Whatever type of kitchen style you’re interested in, we can help you find everything you’re looking for. Check out our designs page for inspiration or have a look through the rest of our blog for inspiration! Our customers’ reviews are pretty great too, so come on down to our Essex showroom and let us help design your dream kitchen.